The final stage of any Shropshire landscape project is the planting although not all of our projects require planting to be done. Some people prefer to source and plant the trees, shrubs and flowers themselves and that's fine as choosing the shrubs and plants is very much a matter of personal choice. 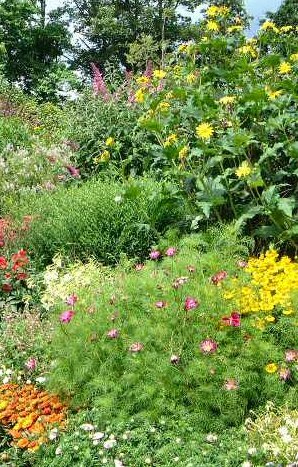 If you prefer for us to source the garden plants then we have a number of Shropshire trade garden nurseries that we can take you to, to choose the plants you like. Alternatively we can select the garden plants for you depending on the space available, and the soil type and pH. We have some excellent trade contacts for nurdery plants and can supply plants from local garden nurseries at around 50% of the cost that you would pay at your local garden centre. If you are looking for low maintenance garden planting then we can select hardy evergreen shrubs that will give you colour all year around with little or no maintenance required. If you are having a planting plan as part of the garden design then we select shrubs and plants within a colour range depending on your colour preferences and the overall colour scheme of the garden design. Foliage with different colours, textures and shapes are selected to fit into the overall design.